Dave is a sales and marketing guru who tells it like it is. He has worked with a number of large well-known companies over the years, and has run his own business and written three best-selling books. He has also been laid off, so he knows the feeling as many of us do. 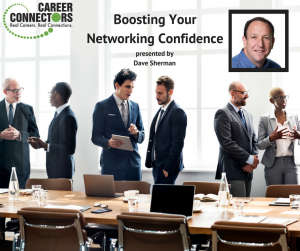 Dave is one of my favorite Career Connectors speakers. 1. Show up early. Be the first person there, or be at least 15 minutes early. Networking is less intimidating that way. –Become an unofficial host – greet everyone at the door, even though you’re not part of the group! 2. Fear of rejection is all in your head. 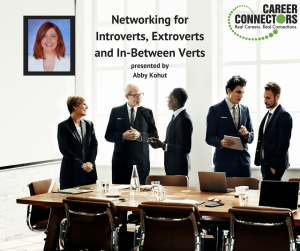 Repeat out loud to yourself several times (until you believe it) before the networking event: “These people want to talk to me.” The purpose of networking is…to network! Everyone is there for the same purpose, so don’t be afraid to jump in and talk to people. Don’t wait for people to approach you, and allow others to dictate your success at the event. 3. Know how to break the ice and what you’re going to say before you get to the event. –Smile, relax and breathe. Smiling makes you warmer, friendlier, more approachable and smarter! Don’t be the grumpy person in the room. –Have a good S.H.E. (smile, handshake, eye contact). Shake hands vertically; don’t use two hands like a politician, make a power play, crush the other person’s hand, shake like a dead fish, or be super dainty and offer only a few fingers. Give the person enough eye contact that you can tell eye color, but not so much that you’re staring a hole through their head because that’s creepy. * What’s your favorite movie? * How are you doing today? * Ever been to this event before? * Nice earrings, tie, pin, etc. * What an interesting name. 4. Be interested, not just interesting. Ask good questions, expand on the answers and don’t hijack the conversation. Also, don’t interrupt–bite the tip of your tongue if you have to. 5. Bring a partner, but don’t spend all of your time talking to them. Have the partner introduce you to people they know and vice versa. Hacienda Healthcare is a non-profit organization that has been caring for mentally and physically disabled children and young adults in the Valley for 50 years. According to Kent, it takes a special kind of person do this kind of work, so they are always looking for RNs, LPNs, CNAs and caregivers. New nurses, pay attention: no nursing experience required, only your state license. This is a great way to gain experience. Other positions will be opened, pending board approval of the new budget, after July 1st. Apply here. Connect with Kent on LinkedIn, as he has many connections there and is willing to help you find work, even if it’s not at Hacienda. Asurion replaces smartphones and tablets that have been damaged. The employees are considered superheroes who can solve smartphone problems faster than a speeding bullet. The culture is fast-paced and fun, with Marvel comics and video games and machines for everyone to use. To learn more about Asurion’s culture, click here. They are always looking for Customer Support Technicians who have both IT expertise and are extroverts who can break down IT concepts for non-tech people. Apply here. MDI Group is an IT staffing agency that places candidates in companies of all sizes. In their branch office, they are looking for a Sr. IT Recruiter; for their clients, they are looking for SQL Developers, .net, Dev Ops Engineers, project managers and BI folks. If any of these positions sounds good, please contact Shannon via LinkedIn or click here. Vanguard manages $4 trillion in assets, even though they’re a relatively new company. The average crew member stays for 9 years, and they’ve never laid off a single crew member! With a 37.5 hour work week, the ability to reinvent yourself, 4% matching and a 10% contribution to their crew members’ 401Ks, it’s not hard to see why. In addition, they have on-site dry-cleaning, 18-23 days PTO, among other benefits. See the company website for open positions and more information. It’s important to get your foot in the door and move up from there. Human kindness is what Dignity Health is all about–compassionate high level care that heals both the body and the spirit. Everything they do is in house, so the positions available aren’t just nurses and doctors, but electricians and construction work, among others, as they are building new towers at Chandler Hospital and Phoenix Children’s Hospital. Chandler’s new towers are scheduled to be fully built and staffed by early 2019. Right now, Dignity is looking for a Director of Cardiovascular – Cath lab. To apply online for positions, click here. Coder Camps is a 3- or 6-month boot camp to learn full stack web development. Many of their students have no prior experience in this industry, which is constantly growing and changing. Because the industry is constantly changing, coders need to constantly update their skills. So once you’ve taken the boot camp, you can come back and update your skills for free. They have upcoming events you can attend to see if coding is right for you, such as Campus Tours on July 11th from 2pm – 7pm and Demo Day on July 7th. Jessica graciously thanked all of the day’s speakers, volunteers and job seekers for participating. 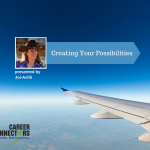 She encouraged job seekers to take advantage of the many Career Connector services like having your resume reviewed, a free professional portrait and visit all of the hiring companies, whether they had jobs in your field or not. She also encouraged everyone to view the career blog, which is up and running and has a lot of good career advice. I must say this was an interesting speaker. Who else do you know that gets a modeling gig at her own book-signing. Joi-Ashli, is a Health Practitioner/Inspired Writer/Alignment Facilitator. She began her presentation by inviting the audience to stand up and loosen their limbs and follow her in a self-proclamation ritual that she says at least three times a day. I LOVE ME! I AM PURE POSITIVE ENERGY, AND ALL POSSIBILITY! Joi encouraged the audience to believe in themselves before they can believe in anything. She handed out a two-page flyer that had the following questions and suggested to the audience that they fill it out. What are some different transitions that we go through in life? There is some opportunity in growth. Asked the group how we lost our jobs? Downsized, outsourced? Laid off? Joi said to break down all large problems into little steps to manage them better. This will allow you to make them look conceivable and acceptable. She continued to ask the entire audience the following questions and provided ways to make it happen. What do you dream of Doing or Being? What do you dream of Having in your life? What it do for me? Will it truly improve my quality of life? How? What might it cost me, financially, time, education, dignity/integrity, identity? What might stand as an obstacle and how will I overcome? Will achieving this dream change who I am? How or Why? What do you love to do that you can expand upon (with/without additional formal, informal education) and make a positive difference in your life, community , the world, and/or make a living through? What steps must you take to achieve this goal? What educational / vocational / experience / service steps must you take? How will you acquire the financial backing your your goal? It is not advantageous to want or ask for new things unless you are grateful of all you have and all you are able to do. The “assignment” was to take home the questions and answer them at the audience’s leisure. But to do it! She believes that if you can visualize what you want, she believes it can really happen. One audience member asked, “How do you get into that zone?” She said that if you put it out there it will happen eventually. She said it helps when you meditate and clear your mind and relax. Imagine it until that time when you finally put it out there and the universe answers you. Picture yourself in that situation, Don’t put your attention on what is happening right now, make your vision your reality. Focus on what you want, where you’ll be. If you need help with finding your job, tell people what you want. One audience member summed it up…you are what your environment is. All goals start with little steps. Starts with your environment. Kent said that the majority of people still don’t know about Hacienda even though they have been around the Valley for 50 years. Kent said he was in the same boat that all of us have been in. Hacienda cares for chronically ill infants, teens, and adults. Their facility is the only one in Arizona. They are hiring for health care positions: CNAs, RNS, and more. Right now they have 40 job postings. They’re looking for dietary aides, housekeeping, janitors, maintenance workers. Go to their web site, and view jobs. When you submit, it goes to the Hiring Manager and they will review your application. They are in constant hire mode. Blanca said she has been in our shoes as well. The success of clients at Cenlar is a key driver of their success. Success factors are Customer Service, Teamwork, Integrity, Initiative, Work-Life Business. Cenlar was formed in 1958 and created by two companies. They service mortgages for clients and also manage their own portfolio as well. Their headquarters is in New Jersey and their new location is in Tempe with 500 employees. They are actively working to build relationships with local charities. with an additional 10 benefits. Revana is a professional inside sales organization with about 1800 employees and growing. Clients come to them as a third party vendor and Revana helps them with account management, customer acquisition, and retention. They work with Google, IBM, Oracle, AT&T, FED EX, and many others. Currently Looking For: Inbound Sales, Outbound Sales and Sales Managers. They are especially looking for people with Google Adwords experience. More information is here: Revanajobs.com. Rodger thanked everyone for coming. Rodger talked about his role at Dynamic World Wide Training Consultants and the training that his company provides such as Juniper training, Cyber hacking (ethical), Digital Media, and Cisco and many others. They provide multiple platform instruction, offer onsite training, and small classroom sizes. They also offer a virtual classroom setup. Dynamic provides post-graduate assistance and Optimal resume assistance for life. Over 95% of their students pass their certification on their first time through. DWTC is licensed by the State Board for Private Post-secondary Education, Certified through Workforce Connection, Approved for Grant Programs. (WIOA), (TAA), and GI Bill.